In Lafayette, culture is essential to people’s daily lives. There are over 95 locally designated landmarks, National Register buildings and districts and significant cultural places located in the parish. From Festivals to Fais Do-Dos, from the Culinary Arts to Grammy-winning music, Lafayette’s culture is what makes it unique, distinct and unified. Lafayette’s Comprehensive Plan has three goals and more than 30 objectives and action items related to the cultural economy and placemaking. In 2017, the Mayor-President also unveiled his CREATE (Culture, Recreation, Entertainment, Arts, Tourism, Economy) initiative, which recognizes Lafayette’s cultural economy as the second largest economic driver and employer in the Parish and seeks to expand its global reach. Beyond culture, the parish has thriving technology, healthcare and education economies. There are parts of the community, however, that are not thriving nor recognized for their cultural, culinary or creative contributions. For more than three decades, North Lafayette has been described as disinvested, declining, crime-ridden, impoverished, under resourced and sometimes even dead. This area represents some of the oldest neighborhoods in the Parish yet there has been little to no intentional or direct investment in most of its communities. Lafayette Consolidated Government now seeks to use creative placemaking to deliberately catalyze change and build wealth in North Lafayette. Goal #1: Redevelopment and catalyzation of Holy Rosary Institute. Develop exterior space to recognize alumni. Goal #2: A Rails-to-Trails program on an abandoned railway. Hold community converstations and a community block party to identify what the space could look like. Complete the planning process including a planning and visioning meeting. Begin to implement the project and build out the trail. 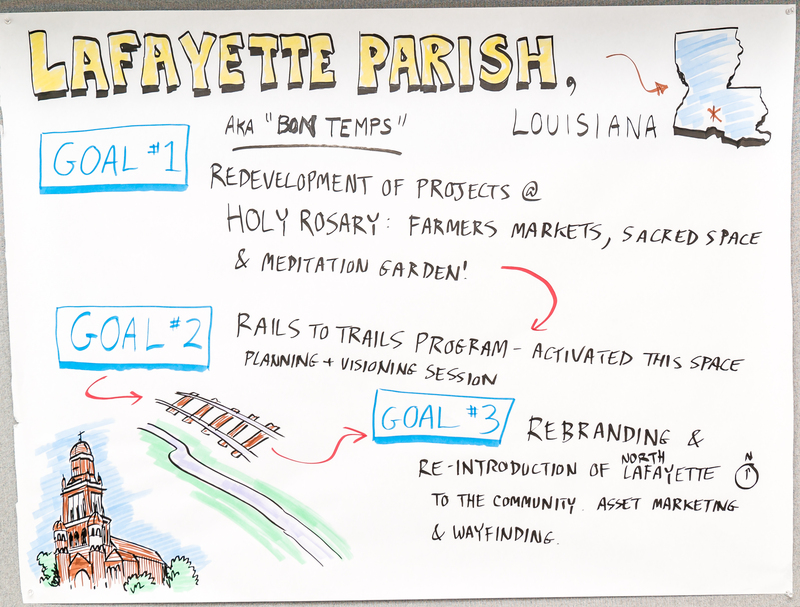 Goal #3: Re-branding and integration of North Lafayette into the larger Lafayette community. Map the community's assets and identify which of those assets to lift up via wayfinding platforms. Hold community conversations to help the community learn to tell their own stories and create a neighborhood level brand. Design and implement wayfinding including public art.